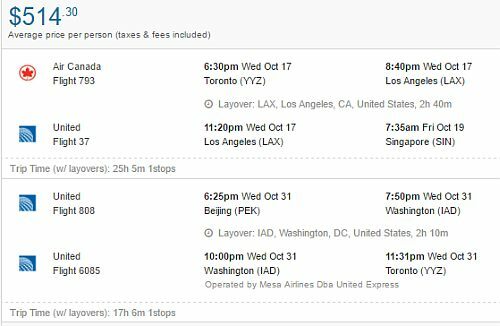 United Airlines is showing open-jaw flights that allow you to fly from Toronto to Singapore, and then return home from Beijing, China for $514 CAD roundtrip. Most options involve 1 stop each way, in San Francisco. toronto, yyz, flight deals, asia, east asia, singapore, sin, beijing, china, pek and united airlines.